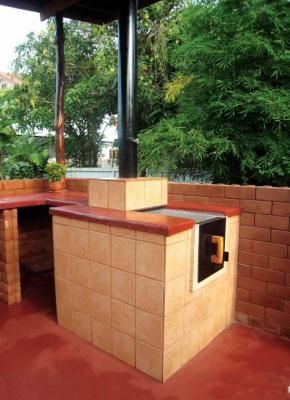 This wood-fired, outdoor masonry stove can be used four ways: for baking, grilling, cooking and smoking. Whatever your cooking needs, this outdoor oven can do it, thanks to interchangeable grill grates and griddle surfaces. If you want to grill steaks or fish, use the grill grate. If you want to bake bread, slide on the steel griddle, stack some bricks on top to retain heat and add the door to hold in the heat. If you want to use the stove top, just slide the metal plate (or griddle) over the top of the firebox. 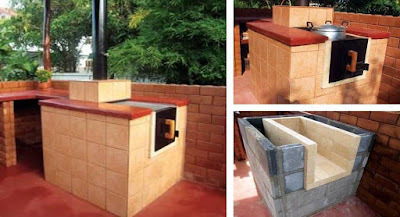 You can build the outdoor oven in stages, a few hours at a time. (You’ll need a few days between some steps.) Check local building codes before you start building. The oven is made from materials you can buy at local hardware or building stores. You may be able to find some of the materials at a salvage yard, too. Even if you only use it to bake bread, you can save enough money in one year to more than pay for the $300 cost. Ideally, the stove is built to a comfortable height with concrete countertop space on each side, plus a roof to protect against the elements. We covered the concrete blocks with tile, primarily for aesthetic reasons, but you could apply stucco over the blocks, or just paint them. Having an outdoor sink and storage space nearby is also convenient. Another key design element is the firebox size — not too small, not too large, but just right. Properly sized fireboxes heat up quickly, have improved combustion, produce less smoke and stay hotter longer. We measured cookie sheets, bread pans, medium and large roasting pans, canners and baking dishes to arrive at our optimal firebox size of 13 inches wide by 28 inches deep by 13½ inches high. Our outdoor oven requires a fire in the firebox for about 45 minutes to one hour to reach a baking temperature of 450 to 500 degrees Fahrenheit. Or, if you want to grill, you can start in less than half an hour. The stove requires almost no maintenance. There’s no need to clean grease out of the oven because it will simply burn away next time you use it. 12 concrete half block 4 in. by 8 in. by 8 in. Total cost: $300. This price assumes you do all the work, and utilize recycled grates and stovepipe from yard sales. Everything new would cost $400-$500. 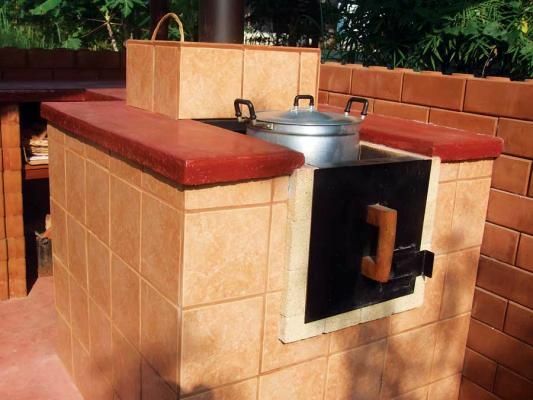 Choosing the right location for your stove is important for convenience and optimizing its use. Putting it near your indoor kitchen will save lots of steps, but consider the direction of prevailing breezes so smoke doesn’t blow toward your house or outdoor dining area. Face the stove door downwind for optimum results. Also, consider privacy, ambience, adequate drainage, and space for wood and fire starting supplies. Optional considerations could include adequate space for a cover (highly recommended), dining space, additional countertops and any other extras you might want. After you’ve selected and cleared your site, build a foundation to support the stove. A low-cost rubble trench foundation is recommended for most situations. The specifics will vary due to climate and soil conditions, but a rubble trench is usually 18 to 24 inches deep and filled with gravel, or gravel and stone. 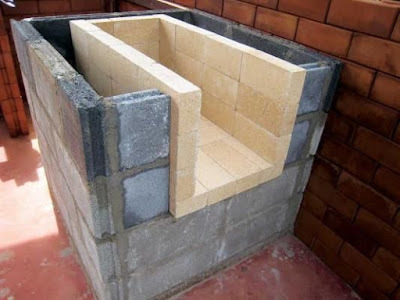 If you’re building the stove in a harsh climate with strong freeze-thaw cycles, add a French drain (a small valley filled with stones) to remove moisture. Raise the building site if necessary to avoid moisture problems. For our rubble trench foundation, we used chunks of recycled broken concrete, also known as “urbancrete,” instead of stone. Concrete chunks from flatwork slabs, such as sidewalks and driveways, work best. They can be recycled and stacked like stone. Stack these up in layers to the top of the trench. Fill gaps with gravel and then tamp solid. The next step is to build a concrete-block base two courses high with ladder reinforcement (a wire mesh designed to add strength and prevent cracking) between each course. Use 4-inch by 8-inch by 16-inch blocks with a few half blocks as needed. No cuts are required in the base if you follow the plans. Be sure to lay the block as perfectly plumb, straight and square as possible. Allow to dry for two days or so to gain strength. Fill the base with gravel or a mixture of sand and gravel. Fill the base with two 6-inch layers, tamping each layer gently. Go easy on the tamping so as not to strain the concrete block joints. All you’re trying to do is settle the materials. Complete the base by pouring a 4-inch layer of lightweight cement level with the top of the block base. 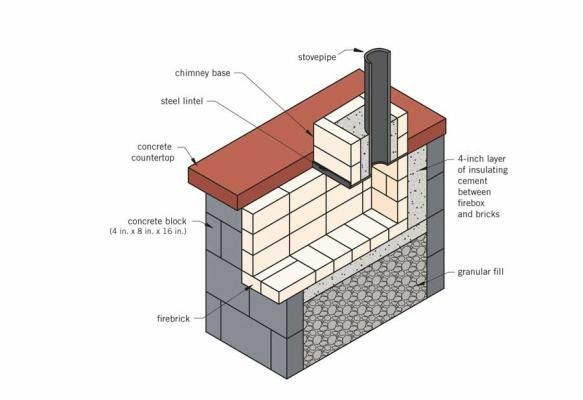 This creates a strong, insulated layer under your firebox. Perlite is perfect for high-heat applications such as this. (According to the Perlite Institute, perlite is used to make gas fireplace logs.) Perlite mix for base: 1 1/3 bags cement, 13 pounds perlite and water. This cement-rich mix is strong enough to support the heavy load of firebricks and countertop, yet also insulate the firebox from the mass below. Let the concrete cure for four to five days.